The new Doctor Who series launches in Matt Smith's home town of Northampton. Doctor Who Star Matt Smith returned to his home town Northampton for a premiere of his first full episode as the Time Lord. "It's good to be back, it's a real privilege. I was completely overwhelmed, it was a raucous and humbling welcome." He said. Matt still has family living in the county and has always stayed close. "I had a wonderful teacher in Northampton and if it wasn't for him I may never had been an actor. So bringing it back to Northampton is great. This show is for the children and when they're pleased I'm pleased," said Matt. He is eleventh person to take on the role of Dr Who since the programme began in the 1960s and he has tried to evolve the character of the doctor. "I was part of the process that decided what the doctor would wear. But I was very keen that there was an element of the professor in his costume and I think the tweed and the bow tie and the braces do that." He said. 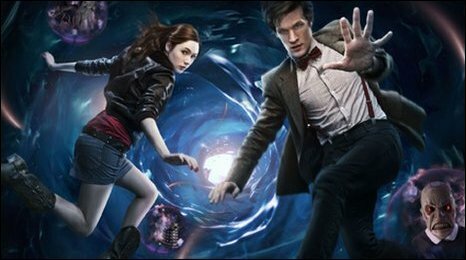 The first episode which was shown on BBC One at on Saturday 3 April, was watched by more than eight million viewers. Matt has tried to develop the Doctor bringing something fresh and new to the role. He said: "I hope he comes across as a sort of intelligent man but he's also the maddest and if you couple those two things together, you do get a nutty professor and I think even his TARDIS feels like a mad, scientific, boffin's lair." All 13 episodes of the fifth series have been filmed and said that there will be some familiar villans. "I think there's a real sense of magic to it and a real sense of the fairytale. We've got Daleks, Weeping angels, Silurians, Vampires in Venice - we've got old monsters, new monsters and I think in Steven Moffat we have one of the most incredible writers in British TV and he's really done a wonderful job." He said.